On April 20, 2016, ICANN published its “Proposed New Bylaws” for public comments. The Draft New ICANN Bylaws were drafted in order to reflect the changes necessary as a result of the recommendations contained in the proposals by the IANA Stewardship Transition Coordination Group (ICG) and Cross Community Working Group on Enhancing ICANN Accountability (CCWG-Accountability) as provided to the ICANN Board on 10 March 2016 and transmitted to NTIA. Taken together, the proposals call for significant governance changes within ICANN, such as the development of new community powers, the incorporation of the reviews currently required under the Affirmation of Commitments, and modifications to key accountability mechanisms such as the Independent Review Process and the Reconsideration Process. ICANN’s Bylaws are its fundamental document and impacts all the stakeholders. 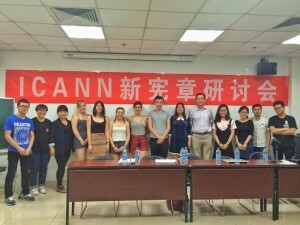 The Chinese at-large community that has been actively participating the ICG and CCWG process, does mind the importance of the “constitutional” document of ICANN. 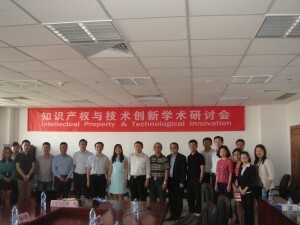 With the support of BNU IIPL, the two ICANN accredited At-Large Structures (ALSes), Chinese Domain Name Users Alliance (CDNUA) and At-Large@China, both of which are the Members of the APRALO, convened the Joint Community Workshop on May 16, 2016, 18:00-20:00 (UTC +8:00) at Law School Auditorium, Room 1922, New Main Building, Beijing Normal University. The Chair of Council of CDNUA, Prof. Hong Xue, the Director of ICANN Beijing Engagement Center, Mr. Song Zheng, and the representative from At-Large@China, Ms. Antonia Chu gave the keynote speeches at the Workshop. Remote participation and webcasting were available at the Workshop. 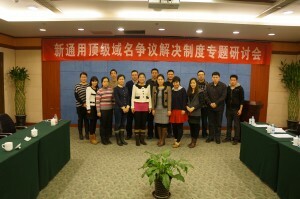 The Workshop was in English to enable equal participation from all countries. 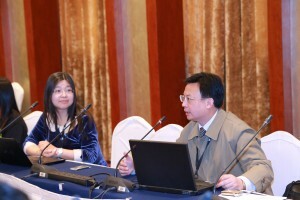 Prof. Xue gave an Overview of newly added and revised contents of the proposed new Bylaws and analyzed the new power structure and its check-and-balance design. Prof. Xue then narrowed down to the key provisions in the proposed new Bylaws, especially in Article 1, 4, 6, 16, 17, 18, 19 and relevant Annexes and analyzed the ICANN’s new mission, commitments and core values, new accountability mechanisms and community powers as well as the series of institutional designs regarding the post-transition IANA function. Prof. Xue pointed out that the empowered community and building justice through IRPs and other accountability mechanisms would better oversee the ICANN’s administration and serve the interest of the global Internet community. Mr. Song and Antonia also shared their views in their own area of expertise and provided their comments on the potential effect of the New Bylaws on the domain name industry and young Internet generation. Members of CDNUA and At-Large @ China, from Beijing, London, Paris, Aberdeen and African cities, joined the Workshop and interacted with the speakers. 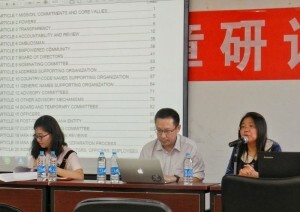 The young members’ made the impressive comments on the ICANN’s social responsibilities. All the comments on the proposed new Byblaws were collected and will be drafted and submitted to ICANN.